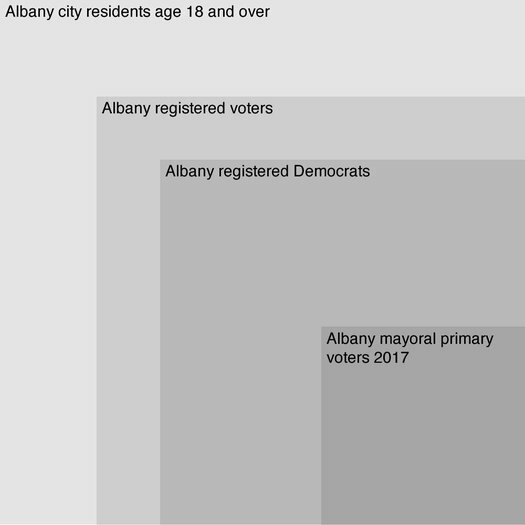 Here's another bit from last week's Albany Democratic mayoral primary: Just about 15 percent of the city's voting-age population cast a vote in the primary. That's remarkable not only because it's relatively so few people overall, but also because the primary is the de facto election for mayor (and other city offices) because of the overwhelming enrollment advantage Democrats have in the city. The numbers are below, but we put together the graphic above as a quick illustration. The biggest square represents the entire adult population of the city of Albany. Each successive square represents the percentage of that population in each category -- all the way down to the number of people who voted in Tuesday's mayoral primary. That 2017 total is bigger than 2013 when 11,363 people voted (Kathy Sheehan win over Corey Ellis), but smaller than 2009's total of 14431 (Jerry Jennings win over Ellis. Sources, in order: Census Bureau 2016 estimate, NYS Board of Elections x2, Albany County Board of Election unofficial results. A way to shake this up? Voter turnout in the United States in general isn't great compared to other countries. And there are all sorts of reasons people don't vote. That said, one thing that might shake up the situation is to switch to some form of an open or non-partisan or "top two" primary. These take different forms in different states around the country, and they all have upsides and downsides (there's always a tradeoff). But basically the idea is to reduce the rigid political party barriers involved in narrowing the field of candidates. And while we're at it, if you wanted to shake things up even more, there could be a setup that allows voters to pick their two favorite candidates from a field with three or more people running. 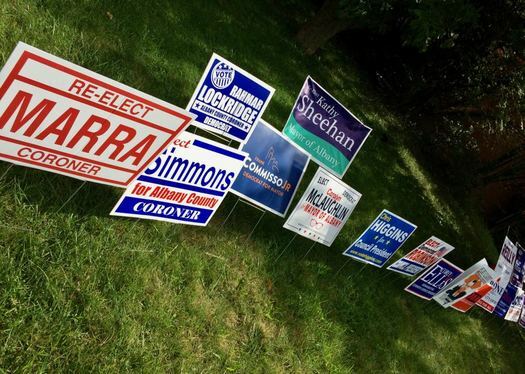 Such "ranked choice" or instant runoff-type elections can help address the problem of a field with many candidates in which the winner ends up not being the choice of a majority of people, which happened in a few Common Council wards this year. (Again, like any setup, these sorts of elections aren't perfect and may have their own downsides.) San Francisco uses an instant runoff system. There's currently a bill in the state legislature that would open the way for a pilot test of this concept in a handful of local elections. These aren't the only sort of changes that might help increase participation. Expanding polling hours or allowing early voting could make it easier for people. And drawing a wider, more diverse field of candidates could also help. None of these sorts of changes are a guarantee that more people would actually show up and vote. But when such a small slice of people is participating, it's worth thinking about how to change things up. REGISTERED voters might be the key here. Just because you lived in Albany when you were 18 and registered to vote doesn't mean you still live here, or even mean you're not registered somewhere else to vote. there is a lot of press about register to vote - but if you move - does anyone follow you to tell you how to UNREGISTER where you moved from? it's not even on the Albany county website and when I sent an email to the INFO address it was summarily ignored! how about we clean up the registration data base? Albany is simply not a democracy. We've had a century of training/socialization that has led to a culture in which party leaders pick most candidates and most election outcomes are known in advance. It's no wonder most people tune out.